The horror of the two atomic bombs dropped on Japan in 1945 is still keenly felt two generations later. Student Kayoko Iwanaga, from Nagasaki, says she has seen many people suffer "mentally and physically" since she was a child. She told her story to On This Day. My father has a special ID which is called The Certification of Victims of the Atomic Bomb. It guarantees he can receive free medical care until he dies. 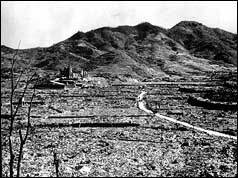 Yes, I am from the second generation of the atomic bomb victims. 9 August 1945, at 1102, the bomb was dropped on my city. Though my grandpa was in another city as a soldier, my grandma, my father, who was two years old, three aunts and two uncles were within 1.8km of the hypocentre. My grandma had serious burning all over her body, including her face. Two aunts and one uncle died. Luckily, my father, one uncle and one aunt survived. The situation there was so terrible, cruel and unbelievable. There was nothing. Even people who survived tended to blame themselves as they could not help family, friends or neighbours. Many of them, especially people who lived near the centre, have suffered the hangover of the radioactivity of the bomb. I never knew how my grandpa cared for my grandma as there was little food, water or medical treatment and no assistance from the UN or NGOs! My young father remembers that his mother screamed and cried every day because of the terrible pain of the burning. He also told me that there were many fleas and worms all over her body. After a long time in pain, she hesitated to go out or appear in public for the rest of her life as the scars on her face were so obvious. She died after 25 years and I have never seen her. What was her life? Had she committed a crime? Did she kill anybody? Why did she have to have such unbearable physical and mental pain? This is one of real stories of the bomb which I have seen and heard from relatives and my father. I know that the US came to my father's school and did health examinations regularly and researched the effects and then developed more atomic bombs. I know that the reasons why the US dropped two different kinds of bombs in two different cities was that America wanted to know the effects by examining them and to exercise its dominance and power after the war. It was just against humanity. Do you still think it was necessary?